HP's new DreamScreen 100 and 130 aren't exactly digital picture frames, though they do have that function and a similar form factor. More like a mini-computer, they stream photos and music, play videos, connect to Pandora, and do social networking. Both the DreamScreen 100 (10.2-inch screen) and 130 (13.3-inch) have 2GB of built-in storage, though they also have a combo flash card reader and USB connectivity for more room. You can load content onto them either through the storage or by a drag-and-drop software interface on a PC. Though it can stream audio and photos (with a really pretty interface, nice big album art), it can't stream video. The DreamScreen becomes more of a mobile Internet device with its Facebook, Pandora and Snapfish photos support. However all of these have limitations. Firstly, all of these are controlled by either a remote or by buttons on the device itself—the DreamScreen isn't a touchscreen. Secondly, in the Facebook app you can only browse your photos, see status updates and view event invites. While the DreamScreen has wireless capabilities it doesn't have a browser function and is more for consuming short bits of online content. It does seem like device primed for applications or widgets (I'm thinking Chumby here), but right now HP is only offering these capabilities. PALO ALTO, Calif., Sept. 17, 2009 – People now can stay current with Facebook friends and photos, listen to Pandora Internet radio, share Snapfish personal photos and enjoy their music and pictures from home networked PCs(1) with a new category of connected screens from HP. The HP DreamScreen, a companion to the PC, connects easily to a wireless or wired network to bring photos, music and video into any area of the home. The screen also transforms social media and web information into consumable, bite-sized pieces. "Constant, always-on access to friends, information and entertainment is a common expectation today," said Satjiv S. Chahil, senior vice president, worldwide marketing, Personal Systems Group, HP. "With HP DreamScreen, social media, web services and digital entertainment can be enjoyed in more areas of the home." 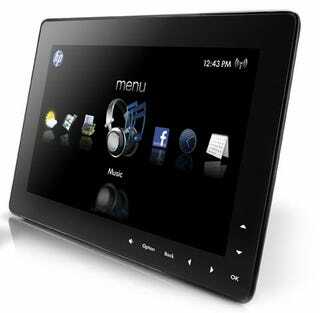 The HP DreamScreen features a piano-black design with a vibrant, flush glass widescreen display. The DreamScreen 100 (measuring 10.2 inches) was designed to fit perfectly on a nightstand or dresser. The HP DreamScreen 130 (measuring 13.3 inches) is ideal for kitchen counters and coffee tables. A product demonstration is available at www.hp.com/go/dreamscreen. The HP DreamScreen comes with 2 gigabytes of built-in memory for storing photos, music and home movies directly on the device. Digital content can be loaded and played using a USB drive or most types of flash memory cards. Photos and music can be streamed wirelessly or moved to the HP DreamScreen by a simple "drag and drop" motion from a networked PC with included software. Finding and playing songs is easy – searchable by artist, album or genre – and is enhanced with album cover art. High-fidelity speakers are built in and include connections to accommodate headphones and external speakers. For music enthusiasts, the HP DreamScreen allows users to stream music directly from the Internet using Pandora. The custom-designed experience makes accessing Pandora accounts easy. Album cover art is displayed and users can personalize their stations by thumbing-up favorite songs or artists to refine their stations. "Pandora's listeners want to have access to their personalized stations on a variety of devices," said Jessica Steel, senior vice president, Business Development, Pandora. "The HP DreamScreen makes it fun and easy for listeners to enjoy Pandora throughout their homes." In addition, the HP DreamScreen gives users access to HP SmartRadio, a new service that aggregates streams of live Internet broadcasts from more than 10,000 radio stations around the world. Users can now listen to their favorite radio stations on the Internet by location or genre in any part of their home. With the HP DreamScreen's capabilities, it becomes the "fourth screen" in people's lives, extending the enjoyment of digital content beyond a computer, TV and mobile phone. The HP DreamScreen includes 802.11 b or g wireless capabilities to access real-time information from the web. By selecting the Facebook icon, for example, users can stay up to date with their social networks while away from their computers. Friends' status updates, photos and upcoming events can all be viewed in real time. In addition to viewing images from a PC, flash memory card or Facebook, customers also can access their own or their friends' Snapfish photos and albums. Photos from any of these locations can be enjoyed in slideshow mode simultaneously with music stored on the device or streamed from the user's PC in the background. The HP DreamScreen also helps people prepare for and organize their day with access to five-day weather forecasts for cities around the world and a view of their calendar. The HP DreamScreen's built-in clock feature can show time in digital or analog format with dual time-zones and lets users choose tones or music for alarms. The HP DreamScreen was designed to be fun, simple and intuitive. A remote control that nests almost invisibly on the top of the product is easy to use, and touch controls that are visible only when the border of the screen is touched provide another way to select activities or preferences. Both models come with a stand and are ready for wall mounting right out of the box. The HP DreamScreen 100 is available today in the United States for $249(2) from online distributors including BestBuy.com, Amazon.com and HPDirect.com. U.S. channel partners include the full range of more than 900 Best Buy retail outlets, which will be selling the HP DreamScreen 100 starting Oct. 11.